You’re headed to the Netherlands and are looking for the perfect expat rentals in Amsterdam. With so many options to investigate, it can be difficult to know where to start. We’ve based our expat rentals in some of our favourite places. Here’s what we like about each one. Located just 10 minutes travel from Schiphol Airport and 15 minutes from downtown Amsterdam is New Amsterdam. 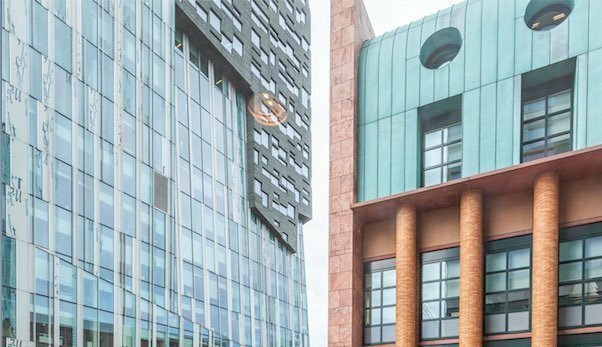 This luxurious residential building is situated in Zuidas, the financial heat of the city. Accommodation wise you can decide to stay in one of the studios, one- or two-bedroom apartments. No matter which you choose, you’ll also have access to a swimming pool, saunas, a gym area, and private car parking (fee). When it comes to neighbourhood restaurants, cafes, and shopping opportunities, you’ll be spoiled for choice. A studio or.. a two bedroom superior? The choice is yours. Whether you decide for a smaller studio or a two bedroom superior suite, you have made the right choice. All rooms in New Amsterdam come with great extras! Did you know that, upon arrival and check-in, you receive a welcome box filled with delicious and, more importantly very useful small gifts? This package is designed to help you out during your first days at the property, help to find your way in the neighbourhood and make you feel more at home. When residing at New Amsterdam Accommodations, you can make use of the in-house fitness and spa facilities. These facilities are open every day of the week and are free of charge for all residents. What’s not to love? Looking for a different option at the Zuidas? Why not choose for an apartment in the Gershwin Brothers building. Just like New Amsterdam, this building offers apartments in many shapes and sizes. Would you like a small studio, or rather a bigger apartment? The choice is yours. These modern, fully serviced apartments come with an equal number of perks and surprises. Besides a small welcome package, these apartments come with a weekly cleaning service including changing your (bed)linen, towels and bathrobes. Of course, the apartments are equipped with Digital TV and WiFi! The Zuidas business district has been growing and evolving enormously in the past years. Currently, the Zuidas offers everything your heart desires- from gyms to restaurants, from bars to cafes. What’s more, there is a shopping center located at 15 minutes walking distance! Or maybe The Hague after all? A short 50 minute drive away of Amsterdam, you will find our La Fenêtre apartments. The complex offers three accommodation types: one-bedroom, two bedroom and executive two bedroom apartments. The apartment complex is situated in a sleek, modern residential building strategically located in the center of The Hague. In need of shopping therapy? A shopping mall and the Bijenkorf department store are located just around the corner. When relocating with children, The Hague is the perfect place for you, since it is the epicenter of international schools.